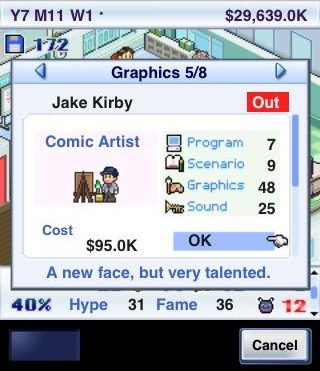 One of the more popular games out there for iOS and Android has definitely been the cult-hit called Game Dev Story. Since the Android Marketplace now allows purchases in the Philippines, and Game Dev Story went on a sale recently, we picked up the game for about PHP 62.00. Yes, only 62 big pesos. Can’t even buy a burger for that amount of money. These days, its back to its slightly higher price of ¥230, which is about PHP 122. (Still at 40% off its original price.) That’s the Android Market price, while the iOS price is at the slightly less friendly PHP 173. ($3.99) Worth your money? Read on to find out! Cute 8-bit characters are building your game. Work them to the bone! The “20 year” game campaign lasts for about about 5-6 hours of gameplay. You can play through longer than 20 years, but the high score system will only track 20. There’s plenty of ways to experiment as decisions are always showing up to make or break whatever you’re making. Mismanaging your resources is one thing, but there’s also a massive amount of customization to your style that you might just find a perfect balance with a radically new combination of parameters. This allows for at least a few extra replays of the career to experiment and see what you can do. After your interest has peaked and waned, it’s still not a terribly unusual idea to start up a new game and experiment with new choices – like building an online RPG swimsuit game. in your posse, then you need to pay up. The graphics are decidedly cutesy and 8-bit inspired, which is great for the subject matter that it sits in. The sound also follows in the same way. Great addicting beeps and chirps and chimes go along with all your game development efforts. 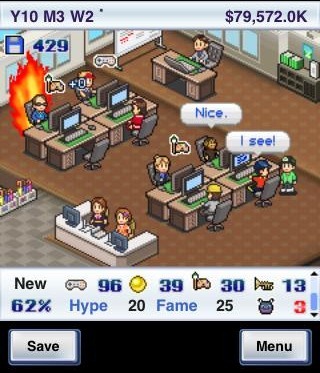 The game runs pretty well on an HTC Desire, with some pangs of slowdown during busy moments as there’s a healthy amount of sprites running around and numbers popping up. On iOS, GameCenter high scores are supported, while on Android the scores are local – which we aren’t complaining that much about. Game Dev Story is an awesome game with a great premise that even tugs on our nostalgic video gaming strings. It promises a deep, SIM level amount of customizable strategy in a shrunk down, smartphone game. The gameplay is addictive to a disturbing amount and we found that it was really difficult to put down. Since we bought it at PHP 62, we definitely won’t regret picking it up. However, at PHP 122 or above, we might think otherwise. Still, it doesn’t make the game any less amazing.